CPAP therapy can be hard to adjust for some sleep apnea patients. In order to adjust to CPAP therapy with maximum comfort, it is recommended to choose a CPAP mask that will be both effective and comfortable. CPAP masks come in 2 main shapes – nasal CPAP masks and full face CPAP masks. However, there are some CPAP masks that offer nasal pillow system that allows it to be placed only upon the patient’s nostrils. The type of apnea mask and sizing could be the most important aspect in the treatment of sleep apnea. Most Respiratory Therapists agree that the proper apnea mask type and sizing is critical to obtaining relief from sleep apnea. An uncomfortable mask will not only make it difficult to sleep, but, will also make you not want to wear it. Most patients are initially fitted for an apnea mask at the sleep laboratory. However, CPAP mask sizing can be an imperfect process. Make sure that you only use a specialized Medical Equipment Professional (usually a Respiratory Therapist) when getting “sized up” for a mask. Additionally, the specialist need to have been trained by the Mask Manufacturers. It is the only way to ensure that you get a proper fit. 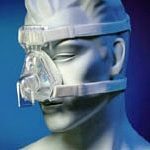 Which is the Best CPAP Mask for Side Sleepers? How do you find the mask that is right for you? Finding a cpap mask that makes you feel comfortable is generally not an easy task. It gets even harder if you are like me – a side sleeper. A lot of people are trying to find a cpap mask that will allow them to sleep on the side. I personally love sleeping on the side and I have been out searching for quite some time. As we all know there is a good variety of cpap masks on the market. The truth though is that most of them are neglecting the needs of us, side sleepers. I have personally used all of the above mentioned CPAP masks for side sleepers and I have to tell you I had quite a challenge finding the right one. 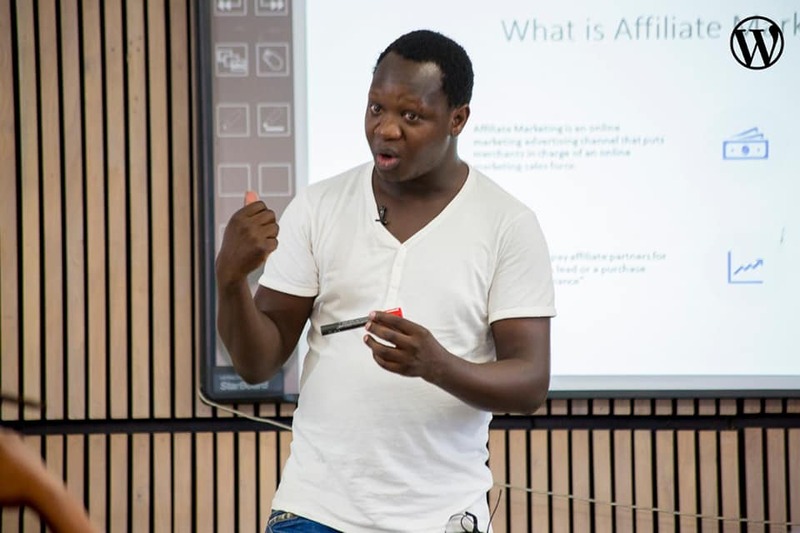 I am not sure what I can share with you will be the right choice for you, so my advice is to try and find the one for you. I found it to be a strictly personal experience. Here is what I can tell you for sure. Waking up to find you have ridged marks on your face is not that uncommon, especially for people that have a deep, heavy night sleep. It doesn’t matter that much which mask you will choose if you like to sleep with your nose/face in your pillow none of the masks will give you a perfect solution. Sealing your mask is a big challenge, believe me… I had the best success with the Brevida Nasal CPAP Mask. Even though when I don’t fit it as I should, I often find the tube moving around and off center which means you have to physically hitch it up and down to get it into position. The only way around is to sleep still. Spend a lot of time fitting the mask, muck around with it and fiddle with the straps until you feel it is right for you. I found that the more I worked on the fitting of the pillow itself the better and more comfortable the fit. At the moment it is truly comfortable and most of the time I am not even aware that I’m wearing it at all. If you sleep on your side, you will end up with mask marks – they have been called the ‘elvis sideburns’ and they can last 20 – 30 mins. But they do go away. I love my Brevida Nasal Mask and I twist and turn, stomach, side, back through the night. Very lightweight, nothing much touching your face. The right size nasal prongs are important because w/out the right size you will be uncomfortable. I hope this comes helpful. Listed below are the variousCPAPp mask types that are available today. Please note, it is very possible that the Sleep Lab where initial testing and fitting takes place may not have had all of these mask types, so check them closely to make sure you have a clear understanding of all of the different mask options. This type of mask is held in place with straps or headgear and seals around the entire nose. The Nasal sleep apnea mask is typically recommended for first-time CPAP users. Most first time CPAP users feel discomfort while wearing masks, so cpap nasal masks are a good substitute for the traditional machines. With conventional CPAP machines, both the nose and mouth are covered, whereas the cpap nasal pillow is fixed at the nostrils. Thus face remains without any extra fitting which creates discomfort. As the mouth is free from the mask in the nasal pillow, straps are stuck over the mouth to make sure that the patient breathes through the air tube. The two types of cpap nasal pillows are extended nasal pillow where it is extended into the nose. In another type cpap nose pillows are fixed at the base of nostrils. Only according to the personal experience the comfortable factor in these types can be revealed. The most striking feature of cpap nasal pillow than other masks is the means by which the masks are stuck in the head. Though the nasal pillows are placed in such a way that it gives limited movement, these nasal pillows are preferred as it leaves less pressure on the face. The design of this pillow should be placed in a manner it is able to deliver air to the lungs in its best way. The best known Cpap nasal pillow systems are discussed one by one. The modern Breeze sleep gear Cpap interface is very comfortable forthe patient to fix when compared to traditional mask headgear machines. It fits on the patient with multiple adjustments and gives the option for resizing. Patients at times interface Breeze sleep gear with Nasal pillows or Dream seal mask. Along with this, an arrangement of thick padding gives more comfort for the patient’s pure sleep during night time. BIPAP is another method to treat sleep apnea. It helps to remove extra CO2 retained in the lungs so that the discomfort is relieved. Mirage swift is one of the light weighted Cpap Nasal pillow systems. The system of mirage swift weighs 70g, so it is placed lightly on the face with more flexibility and comfort. Mirage swift provides easy fitting and removing. Next Respironics invented the first Optilife nasal pillow mask. The Optilife mask is so simple that it needs only one hand to place it. Then the ResMed nasal pillow mask with Head Gear which has less contact with the face seems to be simple and soft. Even the prong cpap mask with headgear is used for comfort. Mostly claustrophobic users use these Cpap prong machines and also the beneficial cpap chin strap. It is also held in place with straps or headgear and seals around both the mouth and nose. The full Face Mask is recommended for people who regularly breathe out of their mouth. When someone is a “mouth breather”, their mouth stays open during sleep. This causes the CPAP air pressure blowing through the Nasal Mask to escape. Thus, rendering the CPAP sleep apnea therapy ineffective as the pressure meant to hold the airway open flows out of the mouth instead of into the airway. The Full Face Apnea Mask creates an environment that equalizes the pressure in both the mouth and nose. The Full Face Apnea Mask also works well for someone who suffers from cases of nasal blockage or congestion from common colds or allergies. This sleep apnea mask works in a similar fashion to the Nasal Mask using a nose cushion that seals over both nostrils, but it differs in the fact that it also fits under the nose instead of around the nose. Additionally, the cushion does not rest on the bridge of the nose or fit over tip of the nose. There are numerous sized cushions available for easy fit. Nasal pillows: These devices seal against the outside edge of each nostril. The pillows open into the nostril but are not inserted inside. Nasal pillows are useful for people who sleep on their stomach or side, or for those with mustache or beard. Nasal Prongs: This device is inserted into each nostril and rather than sealing around the outside edge of the nose, it seals the inside. Oral Apnea Mask: This device fits into the mouth to deliver the CPAP air pressure. It is available in only one size and is intended to fit any user. When this device is used, the CPAP air is not conditioned by the mucous membranes in the nose which results in drying out the mouth. 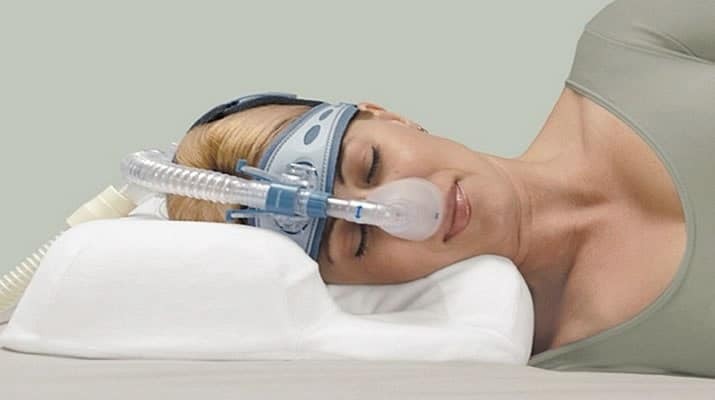 As a result, the Oral Mask requires the use of a heated humidifier attached to CPAP Machine. Total Face Apnea Mask: This mask works in a similar fashion to a Full Face mask except that it covers every opening on the face in areas where air might leak out. A total face mask makes a seal over the entire area of the face, down the sides, under the chin, and at the forehead. It is exclusively used for someone who sleeps on their back. In fact, this is typically used as a “last resort”. First you have to consider whether you are a mouth breather, a nose breather, or a combination mouth and nose breather. It is important to make this distinction in order to allow the CPAP machine to be most effective in delivering its therapy. Next, you have to consider the shape of your nose, mouth, head, and face. We offer many different styles of masks because there are many different facial features and structures to fit. Most masks we carry feature adjustable straps so you can choose the tightness that you prefer. It is vitally important that your mask be the right tightness and fit. For instance, if your straps are not properly secured, you can experience skin irritation. An ill fitting mask can also cause disruption in sleep due to its poor fit quality. It is vital that you find a CPAP mask that you both find comfortable and that fits your unique facial features well and sleeping position. That is the key to success with CPAP! To select the best CPAP mask, you need to know the types of CPAP mask the characteristics of each mask on the market. Once selected the best CPAP mask, to ensure regular cleaning of your mask and check so that it continues to provide the best performance. The most user of continuous positive airway pressure (CPAP) or Bilevel CPAP is out of the recommendations of a doctor or respiratory therapist. The different type of CPAP mask may consider differ, such as: how to adjust the CPAP mask to reduce air leaks, how to maintain the required pressure and maximum comfort, how to wear a special bed pillows and more. 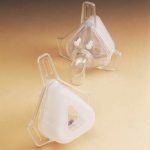 CPAP nasal mask: a triangular shape of the mask, worn over the nose to the upper lip area. Nasal mask fixed on the tip of the nose through straps, the hose attaches to the front of the mask and connects to the CPAP machine. Nasal pillow mask: these “non-mask” mask diliver the continuously flow produced by the CPAP machine into the nose through the pillow mask that sealed around the two nostrils. Nasal pillow system, which fixed by a head, do not need to wound the cheek. Hose connected to the front extending to the top of the head, which makes this mask is ideal for those sleeping on side or stomach. In general, nasal pillow mask do not have the leak problems as a full-face mask. Full face mask : full face mask covering the mouth and nose, which can prevent the air pressure loss problem caused by mouth breathing. It is reported that about 40% of the users of CPAP nasal mask and full face mask experienced air pressure loss problem. The key to the success of CPAP mask is the size fittable, can effectively reduce air leakage. Individual’s nose and facial contours will determine the size of the mask. Weight gain or loss may affect the suitability of the mask, tighten or loosen head gear may be sufficient to adjust the mask size to achieve the most appropriate state, thereby reducing air leakage. Most users of CPAP and BiPAP CPAP masks would choose to select nasal mask, as nasal mask is easier to get used to than nasal pillow mask, and not so claustrophobic compared with full-face mask. CPAP users often switch to nasal pillows once they are experiencing air leakage with their nasal mask. Full face mask is the most suitable mask for mouth breathing or those who tend to sleep with their mouth open. Keep the mask clean : wash the CPAP mask with mild shampoo in warm soapy water everday, then air dry. Pay attention to deteriorate : once there are deterioration phenomenon in the pillows and forehead gel cushions, replace they as soon as possible. Replacement of the forehead pad : replace the forehead pad when the silicon begin to soften, usually in three to six months. Softening of silicon, the mask will not close contact with the face, causing leakage. The good news is that most insurance companies will typically allow for mask cushion replacement every 90 days and a complete new apnea mask system every 6 months. Typically after six months of use most mask cushions start to deteriorate causing the material in the mask to become too soft to hold a seal. It is generally recommended that you should replace pillows or cushions as soon as they start to soften. Additionally, be on the lookout for mask air leaks because they may reduce the effectiveness of CPAP sleep apnea therapy and try to avoid headgear that is too tight which has known to cause facial sores at pressure points.